Normally in March I’d write a massive blog post recapping all of the art fairs that I went to, highlighting pieces I was amazed, delighted, and inspired by. Traditionally it’s been a long, labor-intensive article where I share my top picks from each fair and explain what it was that drew me to each piece. This year I couldn’t stomach giving up a week’s worth of creating time so I put myself on an art fair diet and chose to not go to the Armory at all and instead chose to only go to two fairs: Art on Paper and Spring/Break. I enjoyed both and found multiple artists that satisfied my craving to see great art. I thought I’d share a few here with you. By no means is this a comprehensive list of what I thought was worthy of mention. Think of this as the highlights of the highlights – a lite version of my usual Armory Week review. Enjoy! Drew Leshko’s work, presented by Paradigm Gallery, instantly captivated me. 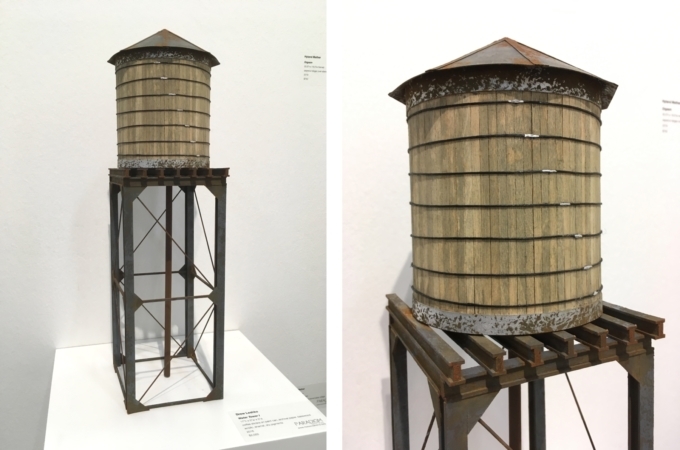 Intricate scale models of iconic New York subject matter (neon signs, water towers, decrepit warehouses) skillfully created using paper, pigment, and everyday ephemera such as paint cans and coffee stir sticks. I found this work particularly enticing because I’ve been creating several scale models of objects for dioramas that will house the characters from the One of Us series. I can truly appreciate the effort and patience it takes to create work on this miniature scale. To give you a sense of scale, the water tower is 17″x5″x5″, and the wee signs are approx. 5″ on the longest side and 3/4″ deep. Jonathan Ferrara Gallery presented self taught assemblage artist Kat Flyn’s work, which stopped me in my tracks. 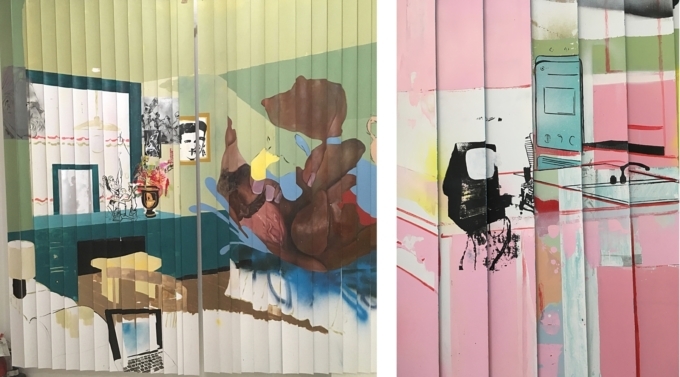 She constructs narrative scenes that speak to the state of American society. 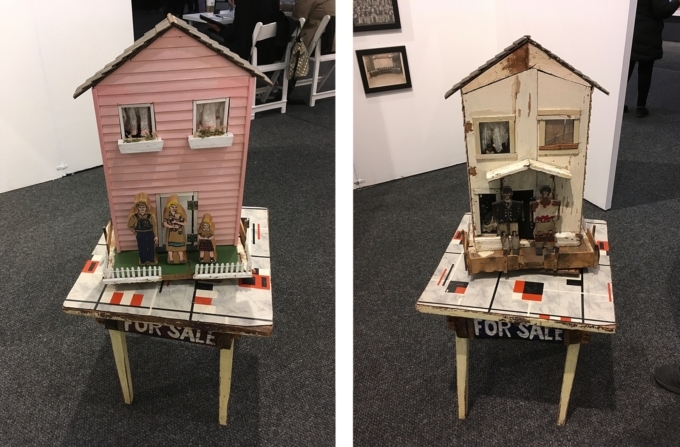 I was especially enamored by her two-sided piece, Foreclosure (2017), which contrasts a picture perfect white folks’ house with the somber reality of an African American home. 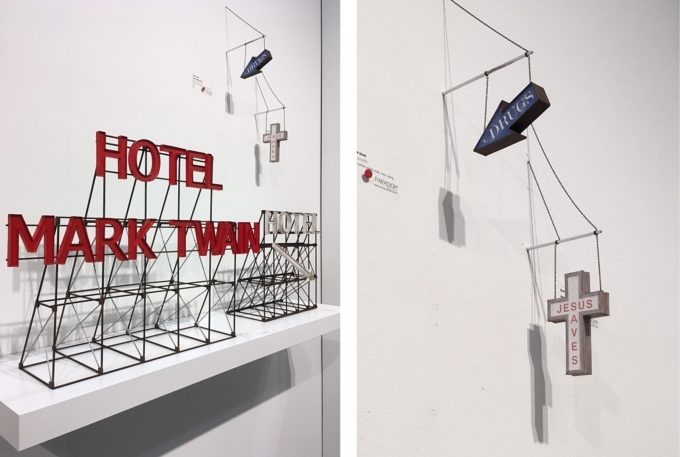 Like Leshko, Flyn recycles everyday, saved objects in her assemblages. In the piece above she’s incorporated a vintage children’s kitchen table and wooden dolls. 45″x20″x20″. You don’t often get to see paper pulp pieces on a grand scale, but Roland Poska of Jerald Melberg Gallery delivered. 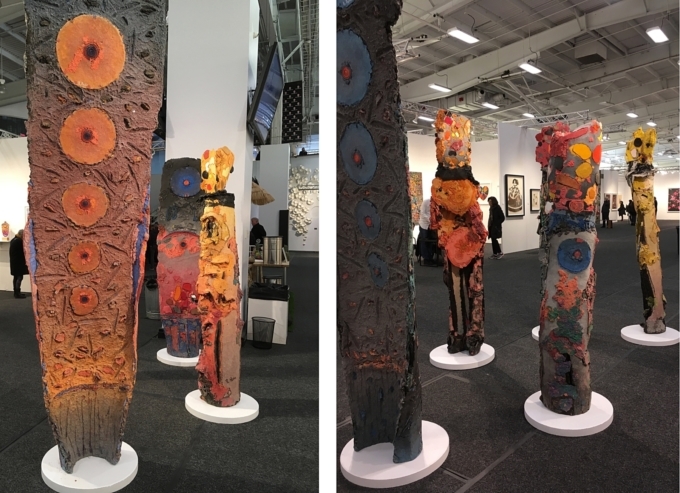 Several grand, pillar-sized sculptures dominated the central promenade of the event space with impressively sized 2-D works being shown inside the gallery’s booth. Seeing paper pulp used on this scale was impressive. The visual texture up close was divine. Big props to artists that deliver interest at both far and near distances 🙂 To give you a sense of scale, the smaller sculptures were about my height. The glass table in front of the wall piece was about 6 feet long. 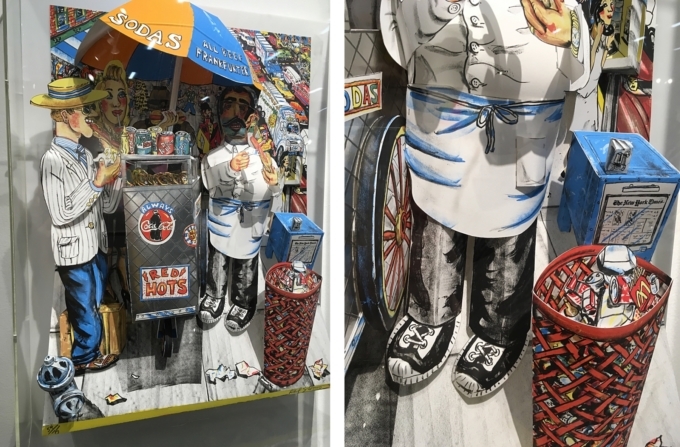 Seeing a playful, Red Grooms’ 3-D lithograph and linocut on paper (Hot Dog Vendor, 1994) that had been manipulated into a relief configuration brought me great joy. Delightful to see the dimension and depth that a few simple slices, folds, and overlaps can bring to a piece. That umbrella! Those shoes! That McDonalds fry box in the trash! 34″x27″x10″. While Art on Paper redeemed itself from last year’s showing, Spring/Break was very satisfying, indeed. This year I made a point of going early enough so that I would be able to see more than just a portion of the booths. 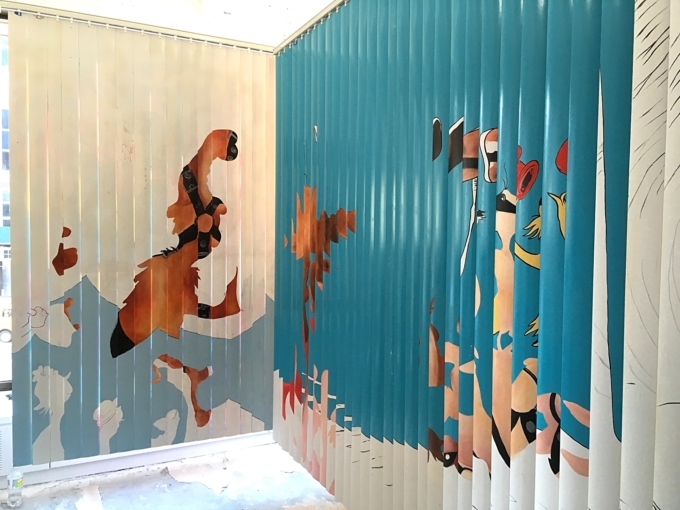 Sam Bennett’s Veiled Pleasures (curated by Jordan Segal), stunning large-scale, mixed media works on vertical blinds, popped up at various locations throughout the space. 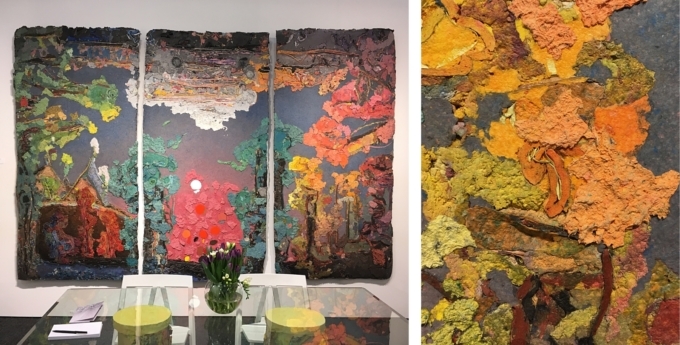 These gorgeous 2-sided pieces were hung to have both sides on view and, able to be manipulated by the viewer, allowed endless visual variations. Acrylic, oil paint, spray enamel and screen print on window blinds. No indication of size on Bennett’s website, but they felt like 7’x8’x3″ (depth when blinds were opened). 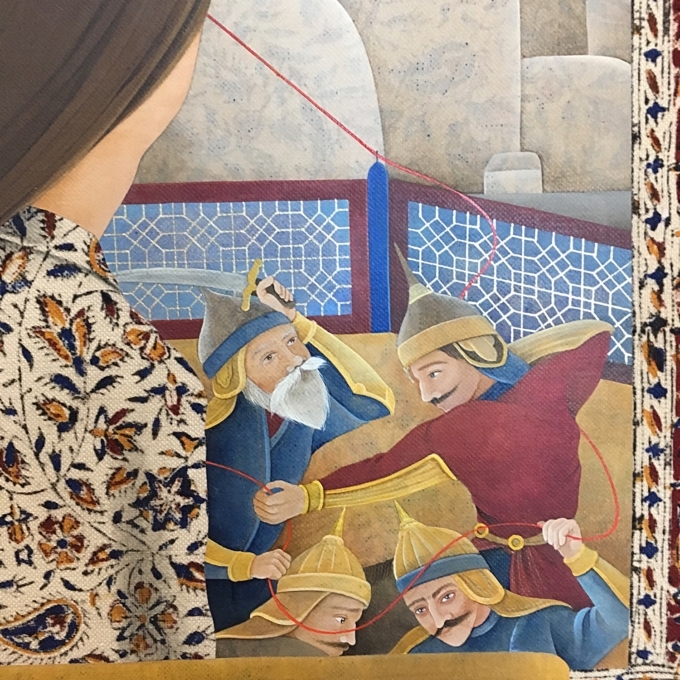 Arghavan Khosravi’s Without Within (curated by Kristen Smoragiewicz) presented everything I want in a piece: concept and practice wrapped in narrative and delivered with pure skill. 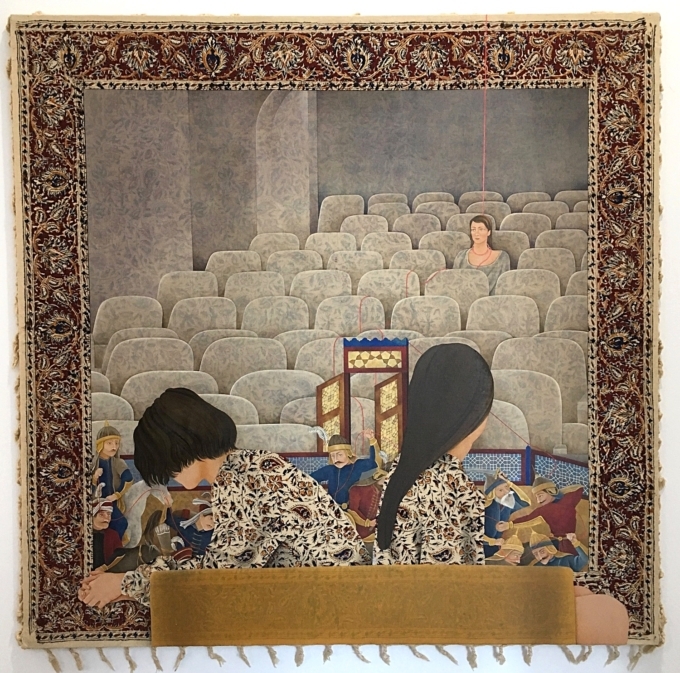 Using tasseled, printed scarves and found textiles as a base for her paintings, Khosravi cleverly leaves the patterned textile untouched in places, and thinly paints over in other areas, using the printed ground to give texture and depth to her compositions. 40″x40″ (on her website, this piece has no title). In each of her paintings a thin, red thread weaves itself around the characters, often with sinister undertones. My photos do not do her work justice. Please, please, please check out her website by clicking on her linked name above. David Opdyke, represented in the Auxiliary Projects booth, got top marks for dark humor and skillful execution. 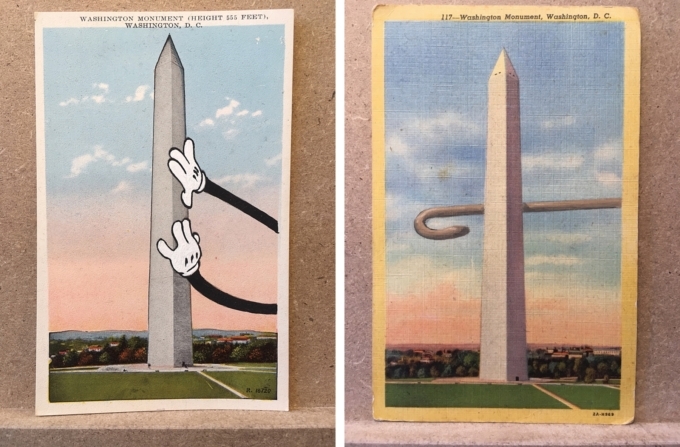 His altered vintage postcard series, several of which are versions of the Washington Monument, both made me laugh and broke my heart. And I do appreciate an artist that makes the effort to give good title. I also appreciated Opdyke’s attention to mimicking the color palette and style of each vintage card that he modifies. 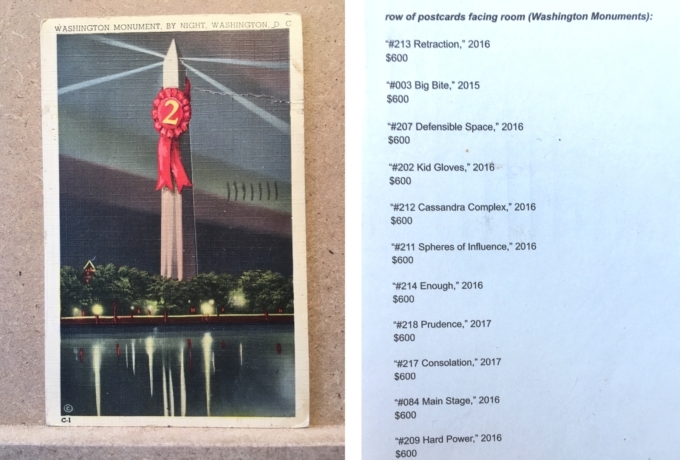 Postcards are 6″x4″. That’s it – short and sweet and to the point. Maybe you found an artist or artwork in this collection that delighted and inspired you, too? I hope you can carve out some time to explore the links I included for each artist. Each one of them is truly worth investing time for a deeper exploration.